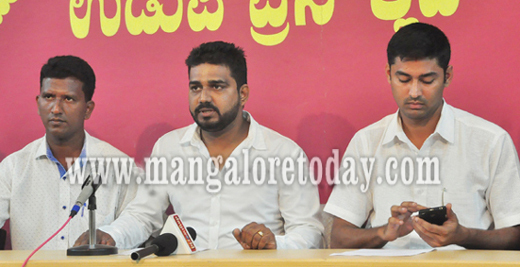 Udupi, June 27,2017 :The Udupi district unit of the Youth Congress has come down heavily on the Sri Rama Sene leader Pramod Muthalik for criticising Pejawar Seer Sri Vishwesha Theertha Swamiji over his organising Iftar Sauharda Koota aimed at fostering communal harmony and brotherhood. Speaking to reporters here on June 27, Tuesday, District Youth Congress Chief Vishwas Amin accused Muthalik of trying to disturb the peaceful atmosphere in the city through such moves. He also strongly opposed the plans of the Sri Rama Sene to hold a protest against the seer on July 2. Stating that the Congress will not allow the protest, he added it would even think in terms of holding a counter protest with due permission of the police. The Youth Congress fully supports Sri Vishwesha Theertha Swamiji in his endeavour to promote communal harmony, Amin added. Several Youth Congress office bearers including Santosh Kaup, Abdul Azeez and Dheeraj were present.